Our home planet is lush with life, covered with oceans and continents, with varied environments. How did it get this way? What processes shaped its evolution and keep changing it through time? How do we know what is inside? There are very many questions to ask about our planet, why it thrives and how it came to be this way. When we look up at the sky, it seems to stretch upward forever. The part that holds our atmosphere is surprisingly thin, compared to the size of our planet. 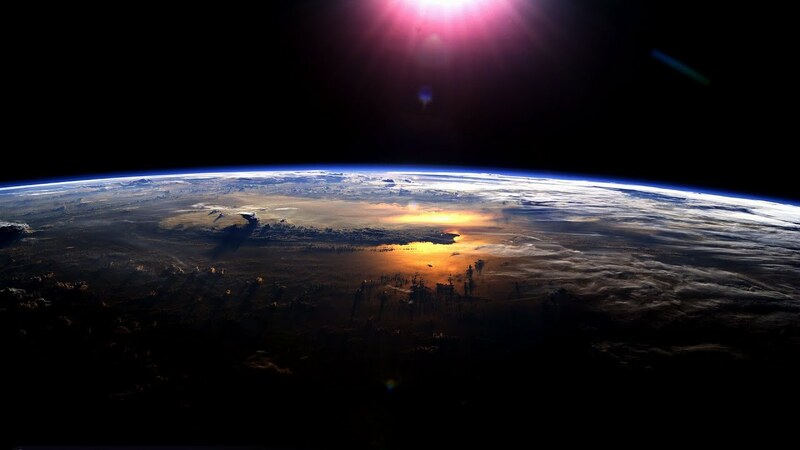 99% of the atmosphere of the Earth is within 25 miles of its surface. If you could drive straight upward at highway speed, within half an hour, you would be above the atmosphere. Earth formed in the inner region of the solar nebula, where the temperature was too hot for ices to condense, but silicates and other rocky material could condense to form the protoplanet. Protoplanet cores continued to accrete material from the circumstellar disk of dust and gas until the fusion began in the star. With the onset of fusion, solar wind swept away the dust and gas, leaving protoplanets behind. When there is enough mass in an object forming in the protosolar system, the gravitational force begins to dominate the electromagnetic force, and the object takes a spherical shape. This is primarily because every mass particle attracts every other mass particle. Electromagnetic force is more complicated, since there are two kinds of charge, positive and negative. Small, spherical protoplanetary objects collided to form larger protoplanets. We believe that the early Earth suffered a glancing impact from a Mars-sized object. The material ejected from this collision probably formed a ring of debris around the young Earth which eventually coalesced into our Moon. The young planet Earth was hot, with leftover heat of formation. We believe it had a primary atmosphere made of the gases that were the most common in the protoplanetary disk, namely, hydrogen, helium, methane, ammonia and water vapor. Some of these gases were able to escape the planet. This interactive simulation from the McGraw Hill Higher Education Astronomy Interactives website offers a good opportunity to explore the mechanism of escape speed. The main concept can be understood like this: if you throw a ball upward with a certain speed (when it leaves your hand) it will rise to a corresponding height and fall back down. If you throw it harder, it has a higher speed and goes higher. The escape speed is defined as the speed you would need to throw an object such that it would turn around and fall back down at infinity. Any higher speed, and it would never fall back down. The escape speed at the surface of Earth is about 11.2 km/s. This is several times faster than the speed of a rifle bullet. The formula for escape speed is shown above. Here, G is the gravitational constant, M is the mass of the planet and R is the radius at which you are measuring the escape speed. The second equation gives the speed of a molecule in a gas of temperature T. k is the Boltzmann constant and m is the mass of the molecule. You can see that for a given temperature, a smaller mass molecule would move faster than a larger mass molecule. This means, at a given temperature, low mass molecules can escape more easily than high mass molecules. Low mass molecules like hydrogen and helium did not remain in the primary atmosphere of Earth very long. Present-day Earth has a great deal of water on its surface. Since Earth lies well within the "snow line" of the early solar system, it is unlikely that this much water would have condensed on early Earth. We long thought that early bombardment of comets must have brought much of the water to Earth. NASA's recent mission to sample material from a comet gives us reason to doubt this theory. Water is made of H2O, molecules that have two hydrogen atoms for each oxygen atom. Mixed in with the normal water molecules are a small number of "heavy water" molecules, where one of the hydrogen atoms is replaced with a deuteron. A hydrogen nucleus is just a proton, where a deuteron is a proton bound to a neutron. The percentage of heavy water present in a water sample is a distinguishing characteristic of the water, like a fingerprint. NASA found the water content on the comet to contain more than three times as much heavy water than Earth's water. We now think that it is possible that early asteroid impacts brought a significant amount of water to Earth. Volcanic eruptions were very common on early Earth, emitting gases like water vapor, methane, carbon dioxide (CO2), sulfur dioxide (SO2) and nitrogen compounds. The addition of these gases helped change the composition of the atmosphere from the primary atmosphere to a secondary atmosphere. Another change that took place happened in the upper atmosphere. There, ultraviolet (UV) light from the Sun interacted with the gases and tended to split off hydrogen atoms from the lighter gases. The freed hydrogen tended to escape. As Earth continued to cool, water vapor in the atmosphere condensed to form vast oceans. Much of the CO2 and SO2 dissolved in the water and surface rock. This left nitrogen as the main constituent of the atmosphere. When life arose on the Earth, it changed the composition of the atmosphere. Blue-green algae, or cyanobacteria, flourished in the oceans. The algae produced energy by way of photosynthesis. Oxygen is a by-product of photosynthesis. Incredibly vast blooms of algae provided huge amounts of oxygen into the atmosphere, necessary for later forms of life. The image above shows formations called stromatolites, made of layers of algae which accrete into formations which can fossilize into rock. The figure above identifies the regions of Earth's atmosphere. Increasing in height, the regions are the troposphere, stratosphere, mesosphere and ionosphere. The blue line in the figure indicates the temperature, as marked by the horizontal axis. Notice that the temperature is about 270 Kelvin at Earth's surface, and decreases upward. The temperature then increases as the blue line bends back to the right, then decreases upward to the boundary of the ionosphere, where it slowly increases again. The boundaries of the atmospheric layers are marked by the changing trends in temperature. The troposphere is the part of the atmosphere where all weather takes place. The temperature decreases with height in the troposphere, and high clouds mark its upper boundary. The next layer upward is the stratosphere. The temperature actually increases in the stratosphere, because of the presence of O3, or ozone. Ozone molecules consist of three oxygen atoms bound together. Ozone tends to absorb ultraviolet light from the sun. The energy from the light causes the ozone gas to heat up, increasing the temperature of the stratosphere. The heating from sunlight decreases in the mesosphere, and the temperature decreases upward, reaching the coldest temperature of the atmosphere. The temperature starts to increase again in the ionosphere. Here, gases are ionized as solar radiation strips electrons from the atoms. UV, x-ray and gamma rays from the sun have high enough energy to release bound electrons from the atoms. Conduction, convection and radiation are three mechanism of heat transfer. Conduction transfers heat by direct contact. When a material is hotter, its atoms move faster. A hot material in contact with a cooler material conducts heat from hot to cold. Jiggling atoms produce jiggling in neighboring atoms. Convection transfers heat by the flow of molecules. You can think of this as something like a migration. Hot gas is less dense, because the molecules bounce into each other at higher speeds. Less dense gas is more buoyant, and tends to rise. As the as cools off and becomes denser, it tends to sink. Radiation is the conduction of heat via light. Electromagnetic radiation is another name for light. When light is absorbed by matter, energy can be transferred to the matter, causing it to heat up. Matter can cool down by emitting electromagnetic radiation. How did our atmosphere evolve from an early stage to become the way it is now? Please watch this video for a recap of Earth's atmospheric evolution.